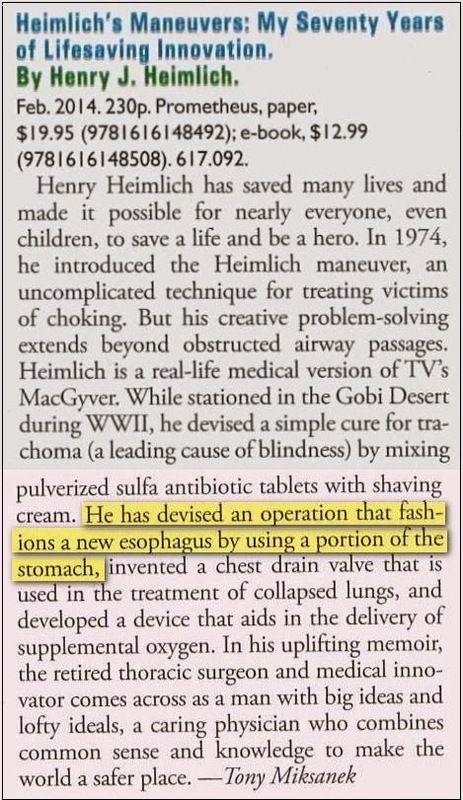 In my father's recently-published memoir, Heimlich's Maneuvers, he rightly credits the late Romanian surgeon Dan Gavriliu with inventing an esophagus replacement operation known as the Reversed Gastric Tube. Since my father got tarred and feathered on the front page of the March 16, 2003 Cincinnati Enquirer for his decades of falsely claiming to have invented the procedure -- for an example, see the video clip at the end of this item -- presumably he realized he'd be playing with fire if he tried to get away with that in his book. But check out the weasel version my father dishes up in his book. He admits that he didn't invent the procedure, but still claims name credit and has the chutzpah to put his own name ahead of Dr. Gavriliu's! Anyway, for some reason pre-publication reviews of the book credited my father with inventing the procedure. Per part I of this series, last month I got published corrections from Publishers Weekly and Kirkus Reviews that resulted in updated reviews giving inventor's credit to Dr. Gavriliu. A few days ago I scored a Romanian hat trick. Here's a 1999 video clip in which my father tells a studio audience -- which includes my mother (the late Jane Heimlich, his sister Cele Rosenthal, and my sisters, Janet and Elisabeth Heimlich -- that he invented the RGT operation.